Wednesday September 24th 1884. Mother and Lee went to the valley in the afternoon. I worked what time I could on my dress and finished it up after supper. Mother got a lot of apples and things to eat. Thursday September 25th 1884. It was a fine day to have the washing done. I sewed some and went to town to have my dress fitted. Wrote to Vene at night. 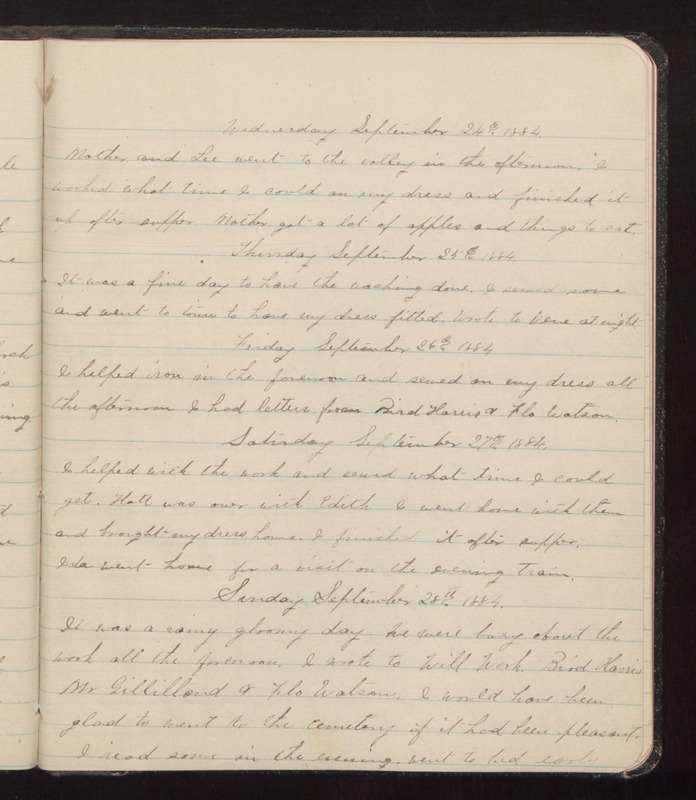 Friday September 26th 1884 I helped iron in the forenoon and sewed on my dress all the afternoon. I had letters from Bird Harris & Flo Watson. Saturday September 27th 1884. I helped with the work and sewed what time I could get. Hatt was over with Edith. I went home with them and brought my dress home. I finished it after supper. Ida went home for a visit on the evening train. Sunday September 28th 1884. It was a rainy gloomy day. We were busy about the work all the forenoon. I wrote to Will Work, Bird Harris Mr Gillilland & Flo Watson. I would have been glad to went to the cemetery if it had been pleasant. I read some in the evening, went to bed early.